Not only is this a physiologically valid question (as you’ll soon learn), but it’s also the subject of a massively successful viral advertisement that generated over $15 million in sales back in 2015 alone. Whether you find it funny or in poor taste, you can’t argue with the results this puerile toilet humor produced. That’s a smashing success by any reckoning! And it goes to show how the Internet’s truly the “wild west” of advertising. However, the response wasn’t terribly welcoming or amused. And Kmart wasn’t doing too well to start with, if you recall. So what’s the difference between Squatty Potty’s and Kmart’s ads? After all, they’re both humorous, controversial, and performed well with the Millennial crowd. Kmart’s a family-oriented storefront, so as you can imagine, “ship my pants” was found offensive by much of their community-minded demographic. 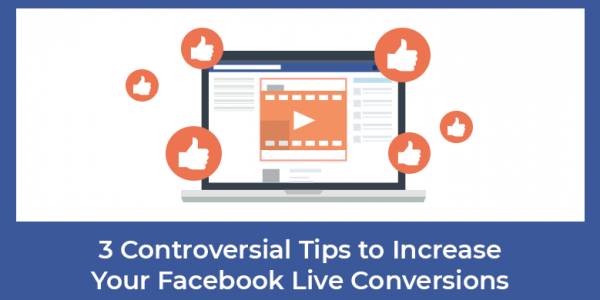 In a moment we’ll discuss 3 methods to appropriately use controversy to build trust and rapport, and dramatically increase your conversions—especially on a live presentation, such as Facebook Live. Because even though Squatty Potty pulled it off like a champ, humor isn’t easy. When executed well, it’s a great rapport builder, which can make you “hip” and relatable. But if you miss the mark, it’s death to your sales. There’s no quicker way to alienate your audience than an off-color joke that doesn’t land, so I’d recommend staying away from being controversial via humor, especially risqué humor. So yeah, I did start this post with two ad examples I don’t want you to follow, but what can I say, we’re not in the business of exchanging a few laughs for attention and dollars. There are a few other controversial topics we want to avoid, but we’ll get to those later. First let’s dive into some recommended methods of ruffling a few feathers! It’s no secret that controversy captures attention. Much like the iconic “record scratch” sound effect, a little controversy shatters the monotony of a regularly-scheduled routine, and perks folks’ ears right up. If you’re too “milk toasty,” you’re just going to create indifference. Because people will tune you out without a second thought, whether you’re marketing on the Internet or through offline methods. I mean, think about it, what controversial topic doesn’t get folks all hot n’ bothered? Every thinking person’s got strong opinions! That’s what controversy has to offer when you’re marketing on the Internet. If you’re reading this, then you already know that there’s no quicker way to connect with your audience and get them to take action than going live on their News Feed. So let’s dive into 3 ways to employ controversy to increase attendance, capture attention, and seriously boost your conversions. If I’m honest, I used to build my business for selfish reasons, but now I want to help people. After all, who doesn’t love a good redemption narrative? But such honesty creates a ton of trust because you’re openly expressing the “negative” about what your offer cannot do. Don’t you want to know more when you see a statement like that? Hey, if you’re looking for some get-rich-quick scheme where you sit on the couch and do nothing, this isn’t for you. You actually have to work to be successful with our products and services. But if you’re willing to put in the time and invest in yourself, then you can achieve x, y, and z. Pretty much everyone is convinced they’re being lied to. It’s likely a product of the increasing level of of specialization in society—as it’s really hard to know everything about the modern world. There’s a ton of knowledge that’s inaccessible to you, me, and everyone else. And look, I’m not here to debate who is and isn’t actually lying to you. In almost every instance above, we’ll never know all the facts about what’s what. After all, we’re not hanging around the Oval Office, or sitting at the CEO of Monsanto’s desk, or invited to private UN meetings, or sitting in at the World Economic Forum, etc., so who knows what’s really going on, right? So you can easily piggyback on this idea by confirming your audience’s suspicions that they are somehow being “lied” to. I mean, don’t you want to learn more when you read those titles? And whatever you do, don’t name names (as there are legal repercussions). This one’s easy and effective. You probably think that getting traffic is hard. Well, guess what, it isn’t. In fact, if you give me 4 minutes to explain, I’ll show you how to get traffic today! It’s so easy your grandma could do it. Because that’s what this is all about, right? It’s a big topic, after all. Then I strongly recommend getting access to my FREE 10-Day Online Recruiting Bootcamp to discover a step-by-step business-building blueprint called “attraction marketing,” which has a decade-plus track record of creating success stories. Simply click here and you’ll get access to our 10-Day Online Recruiting Bootcamp.